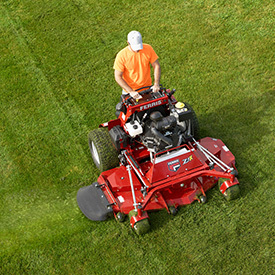 Equip your crew for a new level of power and productivity with the Ferris® SRS™ Z3X stand-on commercial mower. This unit features a pivoting front axle with four radius rods to ensure all four wheels hold their contact – even when conditions get tough. The suspension platform system is adjustable for a large range of weights and operating conditions, optimizing operator comfort and increasing productivity. The Vanguard® Oil Guard™ system is available on select models, extending oil change intervals to 500 hours. The SRS Z3X is available with the iCD™ cutting system in 52-in., 61-in., and 72-in. deck widths.